Geoff was born and raised in Usk, Monmouthshire and was educated at Monmouth School. He has lived, intermittently, in Llansoy for 34 years. He was a teacher for nine years before joining HM Prison Service in 1981 as an Assistant Governor, spending 27 years working in over 100 prisons in England and Wales. He is a former Governor of HM Prison Belmarsh - the highest security prison in UK, a former Governor of Cardiff Prison and Drake Hall women’s prison and retired in 2008 as the Area Manager for public sector prisons in Wales. He also held posts in Prison Service Headquarters, including Head of Security. Geoff spent four years on secondment to HM Inspectorate of Prisons and in 1999 was awarded a Sir Winston Churchill Travelling Fellowship to study prison inspection in Finland and Sweden and now travels extensively around the world as a consultant in prison reform. He is a trustee of the Roger Edwards Educational Trust (Usk) and has also been a Council Member of the Royal London Society and is a Director of “Inside Time”. 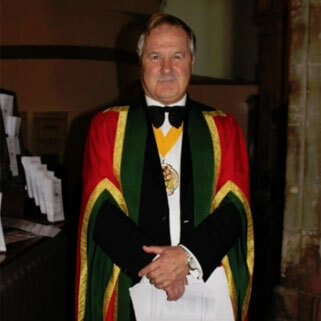 Geoff joined the Worshipful Livery Company of Wales in 2011 and has been a Court Assistant, Chairman of the Awards Committee, Junior Warden and Senior Warden. Geoff’s extra curricula interests include Rugby (played for Newport, Pontypool, Cross Keys, Bath and Monmouthshire), skiing and travel. In September 2010 he climbed Mt Kilimanjaro with 15 former Welsh Rugby Captains to raise money for research into lung cancer at Velindre Hospital. Geoff is married to Sue, a retired teacher who taught for over 30 years in special schools throughout England and Wales. Peter joined the GPO in 1968 as an Apprentice and after learning the tools of the trade qualified as an engineer specialising in external networks and customer apparatus. After completing the associated professional studies he was selected as one of four engineers to take part in a technical interchange with the Netherland PTT (Post and Telecoms service). Upon returning to the UK Peter was successful in a rapid promotion competition and took on his first management post in Gloucestershire. After three years during which he delivered several major network development schemes across Gloucestershire and the Cotswolds Peter returned to Cardiff to take up the post of Inter-utility Network Planning and then Network Operations initially for Cardiff and the Vale and then for South East Wales before becoming responsible for external technical matters across Wales and subsequently nationally. During this time Peter was also appointed as Deputy National Manager for the negotiation and subsequent implementation of the Street Works Legislation, as well as a lead assessor for the BT Graduate selection programme. In the mid-nineties and now working for British Telecommunications Peter became involved in the development of a completely new technology and was the access network delivery manager for what is now known as “Broadband”; this including the development of a new generation of testing equipment and tools and the training and equipping of over 17,000 field engineers for the launch in June 2000. In March 2001 Peter left BT and after setting up his own technical consultancy became the UK Managing Director of a Swiss based, technology, company specialising in the next generation broadband technology which now has widespread applications including the voice communications for Air Traffic Control. After helping to win major contracts from the UK National Air Traffic Control at most UK airports Peter then captured business in Africa and set up, on behalf of the Swiss parent company a subsidiary company in India and appointed a regional director who has been extremely successful in securing major contracts across the region. Peter is married to Jen and has a daughter, Helen married to Mike LeGea and they have a new daughter, Megan. Chairman of the Cardiff Lord Mayor Parade Committee, President of the Rotary Club of Cardiff St Davids and a member of MENSA. Kathy Seddon was born and Raised in Newport and attended St Joseph’s High School, Tredegar Park. She gained a BSc and PGCE From King’s College, London University and went on to teach Biology in schools and colleges in England and Wales. Kathy became a Liveryman of the Worshipful Livery Company of Wales in 2011. She has served as a Steward, Court Assistant and as an enthusiastic member of the Awards Committee with a special remit for Schools Awards. Kathy is a volunteer member of the Marie Curie Research Strategy Group and is a research partner at the Wales Cancer Research Centre. She volunteers as a member of the Brain Tumour Charity Research Group. Kathy has published research papers and made conference presentations on both eLearning and public involvement in Health Research. Kathy enjoys swimming, yoga and tai chi and enjoys watching Cricket and Rugby. Professor Gillian Davies, DL, PhD, a Barrister in practice at Hogarth Chambers, Lincoln’s Inn, in London and Professor of International and EU Intellectual Property Law at the Centre for Commercial Law Studies, Queen Mary, University of London, was Master of the Worshipful Livery Company of Wales during the Livery Year 2017/2018. Her term of office came to an end on 20 October 2018 on the Installation of the new Master, Mr Geoff Hughes. Professor Davies comes from the Lleyn Peninsula in Gwynedd, North Wales, where she has a house at Abersoch. Gillian received her PhD from the University of Wales, Aberystwyth, where she was an Honorary Professor from 1994 - 2016. She is an international expert on intellectual property law and from 1991 – 2005 was a legal member of the Boards of Appeal at the European Patent Office in Munich, becoming the presiding judge of a Technical Board of Appeal and Permanent Member of the Enlarged Board of Appeal in 1996. Gillian is also the author or co-editor of several practitioners' and academic books on intellectual property and was Chairman of the British Literary and Artistic Copyright Association (BLACA) from 2014 -2017. She is a member of the Council of Bangor University, Honorary Patron of Ensemble Cymru (the chamber music ensemble) and was a Director of the Snowdon Mountain Railway, with which her family had connections, for many years from 1972 -1999. In 2001 she was appointed Deputy Lieutenant for the preserved County of Gwynedd. Gillian joined the Livery Company in 2008 and was appointed Court Assistant in 2009. 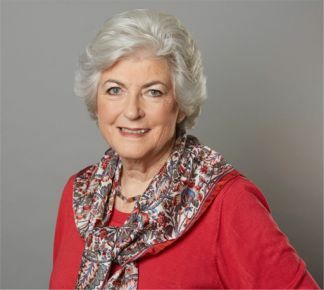 As a member and former chairman of the North Wales Committee of WLCOW from 2010 – 2015 she has been very active in promoting the Company in the North, in the recruitment of new members from North Wales as well as in the awards programme in North Wales. During her year as Master 2017-2018, the Company celebrated its Silver Jubilee Year, having been established in 1993. Several special and successful Silver Jubilee events (both celebratory and fund-raising) have been held during 2018 so far and Gillian’s aim remains to raise at least £100,000 before the end of 2018 in order to enable the Company to expand its annual awards programme in the future. 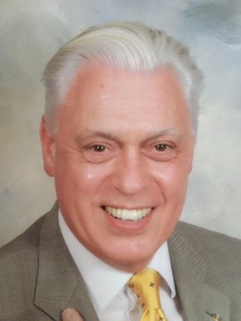 Christopher Dale was trained by J Lyons and Co in Hotel management and has been working in the Hotel and Catering profession since 1972. He has worked at many of the famous London hotels including the 700-roomed Cumberland at Marble Arch and 800-roomed Strand Palace Hotel. He joined Trust House Forte in 1978 after the takeover of Strand Hotels and became deputy General Manager of the Waldorf Hotel and General Manager of the London Ryan Hotel for Thistle Hotels before joining the private Hotel sector. In the private sector he has worked in Dartmouth and in Kent for Country Club Hotels and Golf Courses. He is a member of the HCIMA, now Institute of Hospitality and has extensive experience in running public facing businesses. He moved to Wales in 1995 to take up a General Manager role at a County House Hotel and has been here every since. He joined the Firing Line Museum, the Regimental Museum of 1st The Queen’s Dragoon Guards and the Royal Welsh, at Cardiff Castle as Director in May 2009. Married to Pauline, he is a local Magistrate and Rotarian. 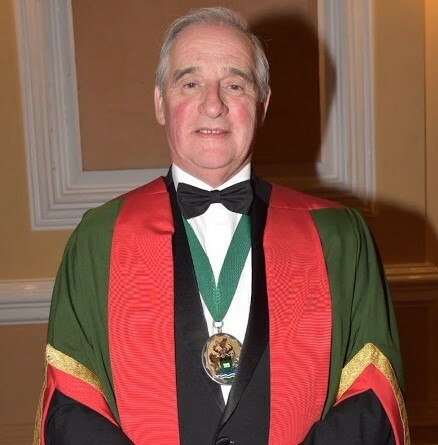 He became the Clerk to the Worshipful Livery Company of Wales in February 2019.